Dolph Lundren stars in the action adventure series SAF3 being shot in Cape Town at the moment. 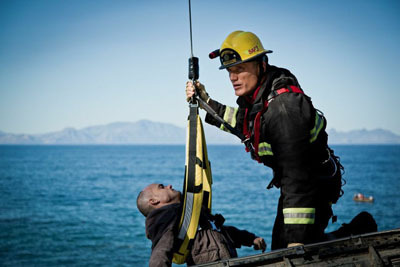 Cape Town is not only doubling as Malibu for the filming of the action adventure series SAF (Sea Air Fire) 3 which has action star Dolph Lundgren as it main protagonist, the producer believes it’s prettier. The series, produced by Gregory Bonann, focuses on the drama and adventure surrounding an elite division of California’s Malibu Fire Department. Shooting for the series begun two weeks ago in Cape Town, providing 200 local jobs and injecting R160m into the local economy. Bonnan, who was involved in the creation of Baywatch, said Cape Town was “gorgeous” and “prettier” than Malibu. He said the series focused on the SAF 3 team who were heroes answering “the most challenging calls” and viewers could expect to see “daring rescues” in dangerous situations as the team tried to save lives. He said each episode centered on big-action rescues as well as the camaraderie and friendship in the elite rescue team. Cape Town Film Commission CEO Denis Lille said the production team had 103 days of filming this season lined up, to create 20 episodes. The principal location was Camps Bay beach where a semi permanent set has been built.